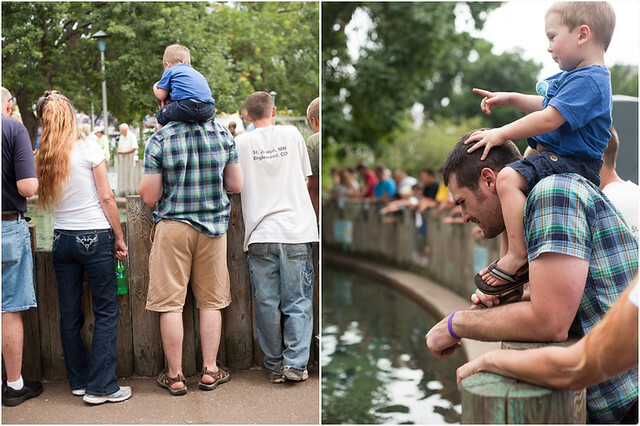 Yesterday, along with 111,889 fine folk, our little family of four went to check out the Minnesota State Fair. 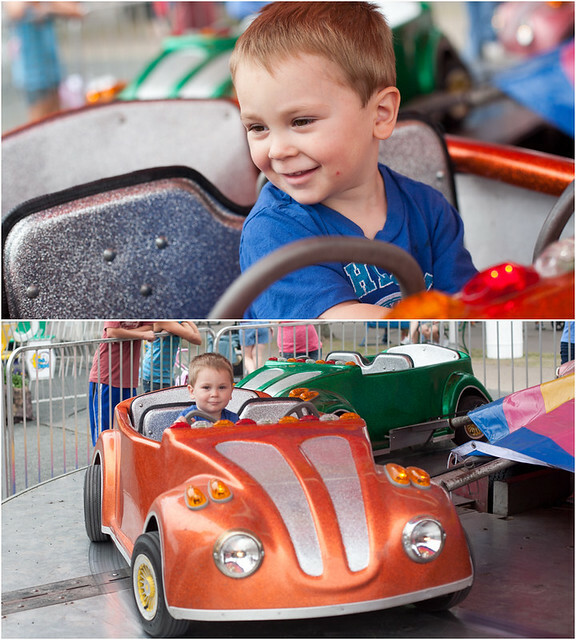 Of course, it's touted as The Greatest Fair of All, which we whole heartedly agree with. We wanted to get out of the house around 9am or 10am and just barely made it out by 10am. Without fail, Tony's first order of business is buying a corn dog. 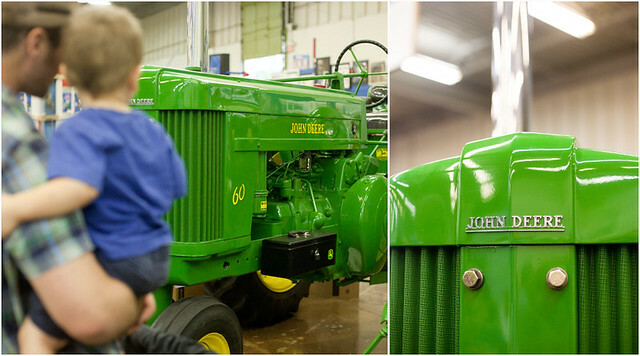 We also checked out this rebuilt John Deere. 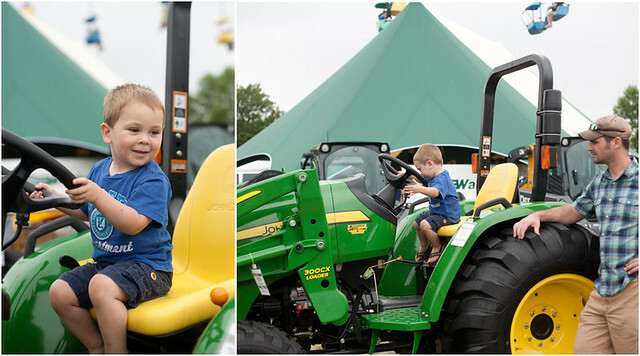 Oh, it was only the beginning of tractors for Isaac! I don't even know how much time we spent on Machinery Hill. It felt like hours, but I had two happy guys. The other perk to Machinery Hill? Proximity to Giggles! Love this place and I had to try the Salad on a Stick. It was absolutely worth it! Isaac was a much more willing participant at the helping farm hands display. He even fed the chickens and milked a cow, all were fake of course. Right around nap time we made the mistake of passing through the kids' midway and Isaac begged to go on the car ride. At $2.25, it was totally worth his excitement, so we gave in. I had smiling dude's all around when Isaac got off the car ride. 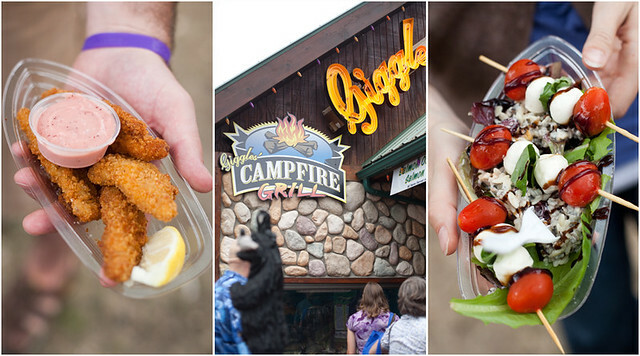 Veggie Fries, Beef & Wild Rice Corndog, and good old fashioned Cheese Curds. 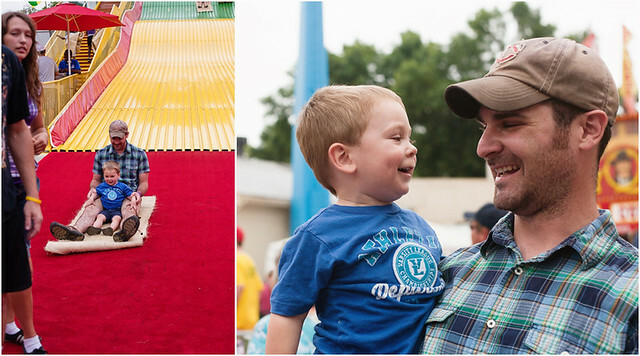 Tony was so looking forward to taking Isaac on the Giant Slide again. 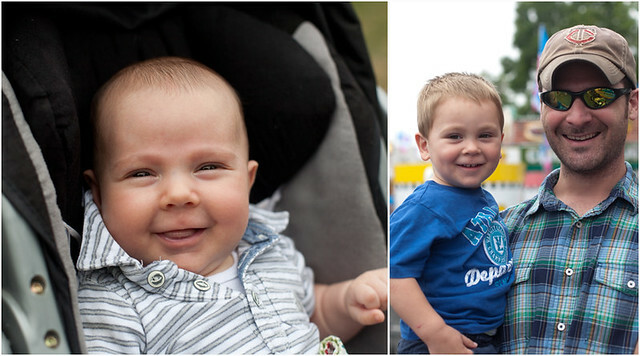 Last year Isaac was a little terrified, but this year he was giggling the whole way down. He got super amped up when Tony told him he could go down again, but with me this time. What I didn't tell Tony was that I'd never been down it before. Truth be told, I was a little scared, but it was so fun! The next tradition, checking out the fish at the DNR exhibit. Always a hit! 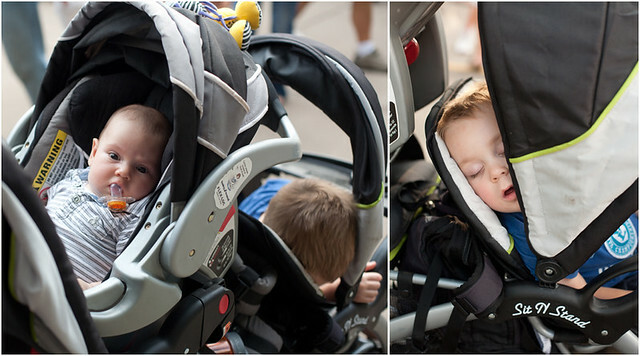 We weren't sure how long we were going to stay at the fair, but Isaac made the decision for us when he actually fell asleep in the less than reclining stroller. We also ran into these two lovebirds. 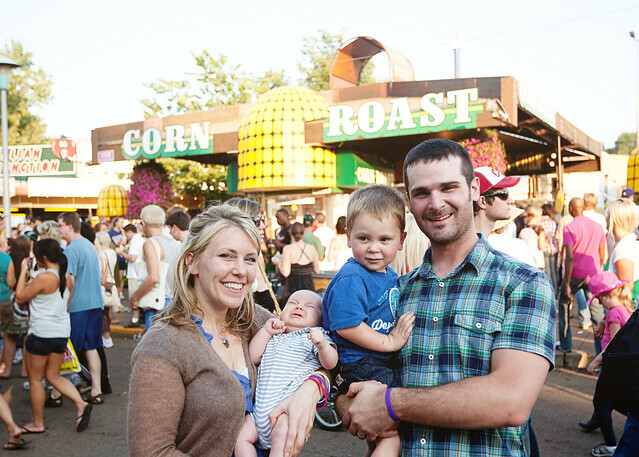 Just in time for Levi to take our annual family picture in front of the Corn Roast stand. 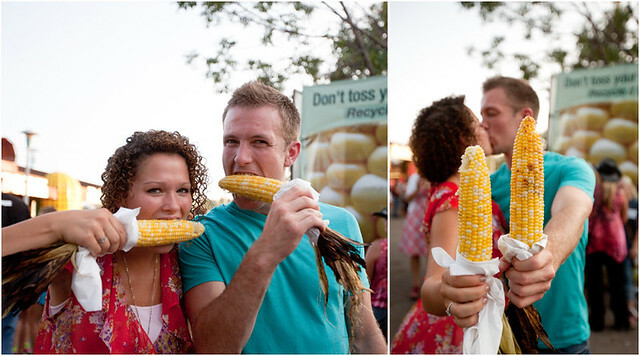 And with that, we closed out the summer at the 2011 Minnesota State Fair. 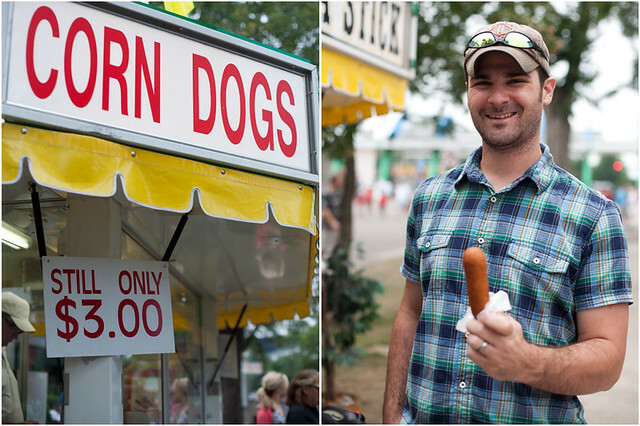 Ah, just the other day I was watching an episode of Andrew Zimmern's "Bizarre Foods" and he was at the Minnesota State Fair eating a wild rice corn dog! 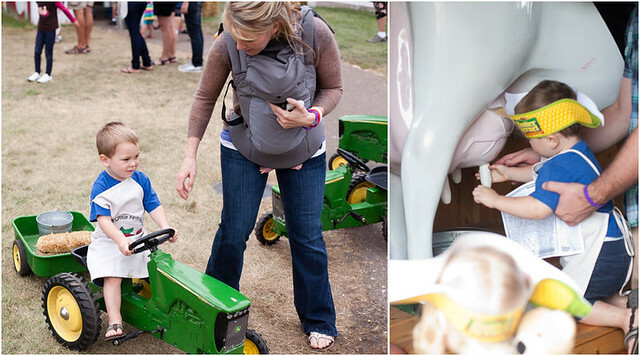 I've never been to a state fair, they look so much fun! That last video is so adorable!! He must have really enjoyed himself! I love the video of you going down the slide - so cute. The salad on a stick looks really tasty - maybe we should've thrown in few healthier options. Oh well, there's always next year! My dad took my brother and I to the MN State Fair every year when we were little (and lived in MN). I LOVED the giant slide! It was always my favorite. Cute videos!! You have such a nice family. I would have to agree that the MN State Fair is the BEST! Too bad we are going to miss out this year. With bachelorette parties and working schedules, it just wasn't in the cards. Which makes this pregnant chick a little sad... 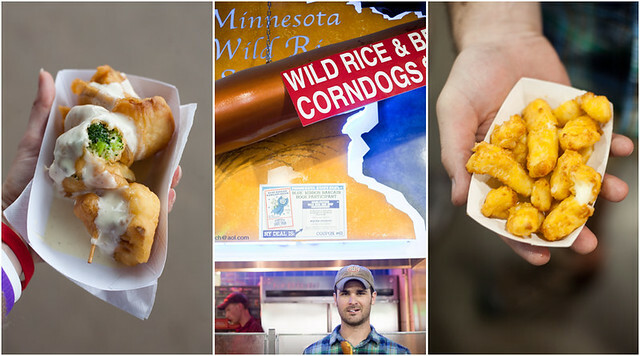 It's seriously fried food heaven. And the best cheese curds in the world are found there... Oh how I'm going to miss them :( Looks like another great time was had!! Looks like so much fun!! You have an adorable family. Isaac reminds me so much of my little guy! Just wanna eat him up! Lol. Enjoy your weekend! I absolutely love fairs... so much in fact, that I'm taking a vacation day to attend out county fair. I'm not joking. I love Isaac's little voice. So cute saying goodbye to the fair! I also love that you went down the slide! Hilarious! I ALWAYS love your fair posts. <3 What a great day! I love your blog! I just found it! You are so adorable, and your boys are cutie pies! Can't wait to get to know you better!